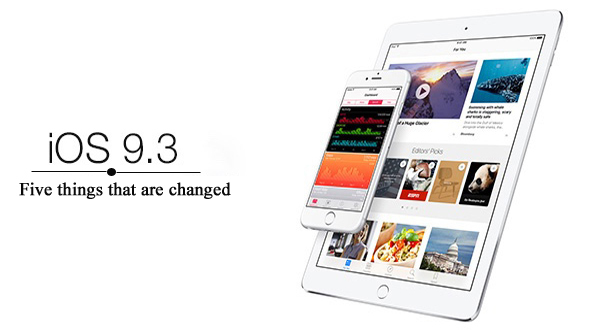 Apple has recently released a new version of the Mobile OS iOS 9.3 beta. When we compare features, by far this is one of the biggest update Apple has released after iOS 9.0. We found some interesting changes in iOS 9.3. Today in this article we are going to talk about the five features which has been added in the new OS. First change we found in iOS 9.3 is Night Shift, that’s designed to automatically cut down on the amount of blue light an iOS user is exposed to at night by shifting to more yellow tones for the iPhone or iPad’s display. Studies have suggested blue light exposure at night can disrupt the circadian rhythm, making it more difficult to fall asleep. You will find the Night Shift settings in the “Display & Brightness” section of the Settings app. Apple has added new 3D Touch Quick Actions for several of the stock apps, including Weather, Settings, Compass, and Health. Weather’s Quick Actions allow you to see the weather at your current location or for saved locations in the app. This time Apple has given extra security to your Notes by making it password protected. This time iOS9.3 gives you an option to use Touch ID or a password to protect notes within the Notes app. Password protection for Notes can be set on note-by note basis within the Notes app. You will also find new options in setting to organize notes by Date Edited, Date Created, or by Title. With iOS 9.3 you will come across several updated CarPlay apps. For example, the Apple Music CarPlay app now includes New and "For You" sections for the better Music discovery, and Map is more mature then previous version, which now offers better access to information about what’s close by, providing suggestions for local gas stations, restaurants, coffee shops, and much more. Means now with iOS 9.3 you can be more dependent to your Car Play Apps. Apple has improved the news app in iOS 9.3 to make it more tailored to each person’s interests. The “For You” section will also incorporate the trading topics and specific picks from Apple editors to help users better discover content. These are five changes you will feel once iOS 9.3 is released for the users.